Derek says:: What is it with PC component categorisation? Like many geeks I buy my computers as components and assemble them myself, taking great care to make sure the quality and compatibility of kit is as good as i can afford. 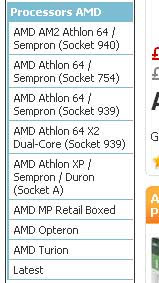 One thing of constant annoyance however is the inadequacy of online PC component retailer's product categorisation and searching facilities. With all the different types of processor, RAM, hard disks etc that are available accurate categorisation is essential for you to find what you're looking for. Why is it then that so many of the online component retailers have these lacklustre categorisation schemes in place, often repeating categories of product e.g. "Core 2 Duo" and "Core Duo 2". It does seem to be CPUs that suffer the worst, probably because of the many different ways you can group them; by manufacturer, product line, socket type, number of cores etc. A lot of these retailers only allow a product to be in one category rather than "tagging" products with all their relevant information and allowing a user to group by anything. Because of this one category restriction each retailer has gone with what they see as the best categorisation, the problem being that none of them are the same and most of them are inflexible. The result of this is a very poor user experience making it difficult for the consumer wanting to shop around. What's needed is an open data initiative between the component industry and retailers to standardise on these categorisations thus empowering the consumer to find what they're looking for more easily. As much as this sounds like a massive plug, the only online component retailer i regularly use is dabs.com as they're the only one i know of that implements a good product categorisation scheme. So take note ebuyer et al - proper categorisation pays!